Small and medium enterprises (SMEs) (defined as firms with fewer than 100 employees) are vital to the private sector the world over: In fact, more than 95 percent of firms are classified as SMEs, and over half of all employees in low- and lower-middle-income countries work in them. Despite the overwhelming proportion of SMEs in the African private sector, these firms face higher obstacles to growth than large ones. In particular, African SMEs encounter significant impediments in financing, according to a recent Africa Growth Initiative report from Thorsten Beck and Robert Cull. In many ways, trends in SME financing across the developing world are similar; however, as the authors of the report point out, sub-Saharan African firms do not completely conform. 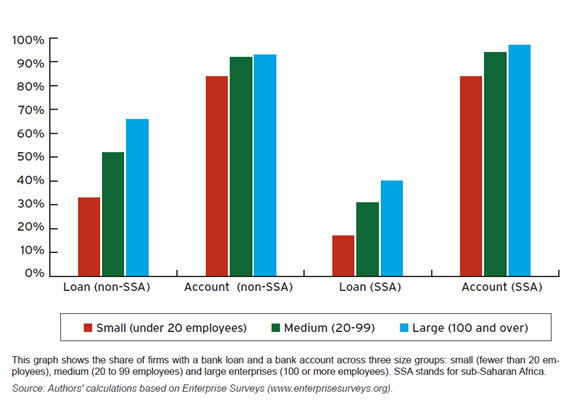 For example, in general, older and (relatively) larger firms are more likely to have loans (Figure 1). Within this larger trend, however, sub-Saharan Africa stands out: Non-sub-Saharan African small enterprises are almost two times more likely to have a loan than African ones. The report also explores the same tendency within the age of firms: While in the developing world overall, younger firms are less likely to have a loan, those in Africa are very less likely. Since sub-Saharan African firms are so less likely to have a loan compared to the rest of the developing world, it is not surprising that access to finance is overwhelmingly the most commonly cited obstacle to a firm’s operation and growth in Africa (see Figure 2), as Beck and Cull note. 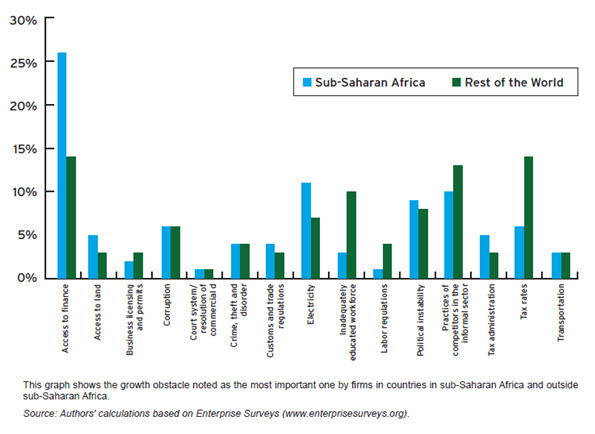 In fact, 26 percent of African firms state that access to financing is the number-one challenge they face. In contrast, the number of firms in the rest of the developing world claiming access to finance as their top impediment to success is almost half that number: 14 percent. Firms outside the region name tax rates and practices of competitors in the informal sector about as often. Why Don’t African SMEs Have Loans? Beck and Cull argue that a major reason the number of loans in the region is so low is because Africans are not applying for them. 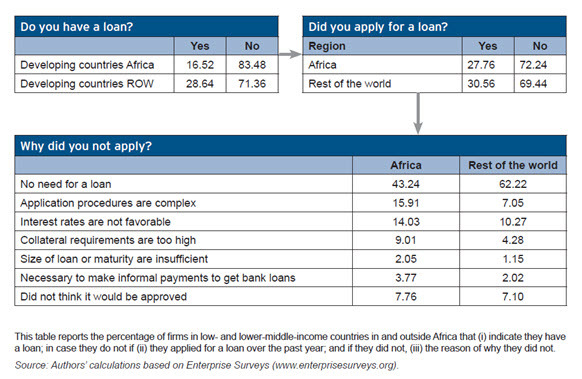 As seen in Table 1, only about 28 percent of African SMEs have actually applied for loans. Though this number is not too different from the rest of the developing world, the reason that sub-Saharan African SMEs do not apply differs immensely. More than in the rest of the developing world, SMEs in sub-Saharan Africa cite unfavorable interest rates, complex procedures, informal payments (e.g., bribes) and high collateral requirements as reasons for not applying for a loan. Table 1: Why Do Firms Not Apply for Loans? In their paper, Beck and Cull also explore how banking sector characteristics in the developing world affect the probability of an SME having a loan. The authors do not find any statistically significant relationship between firms’ access to external finance and branch penetration, ownership structure or concentration of banking systems for the overall developing world. Similarly, the authors find no significant evidence that factors like overhead costs to total assets or the net interest margin are more or less significant in explaining the lack of African firms’ access to external finance than firms in non-African developing countries. In light of these particular obstacles facing African small and medium enterprises, the authors posit a number of policy recommendations. Interestingly, while Beck and Cull find that there is no significant relationship between foreign bank penetration and access to credit within Africa, they argue that foreign bank entry should still be encouraged as a means to increase access to SME financing in Africa. Foreign banks in Africa no longer only include those from developed countries, but also those from developing countries—which bring experience in similar markets to Africa and therein could possibly help address the region’s obstacles to SME finance. In order to circumvent the obstacles of high collateral requirements and lack of credit history, the authors also suggest leasing as a tool for SME financing. Leasing is less transaction-heavy, guarantees that funds will not be used for other intentions, and is assessed based on a project’s capacity to service lease payments—all of which ease the burden on a SME of obtaining external financing. The paper also argues that factoring (when a third party purchases the seller’s accounts receivable and assumes the responsibility to collect repayments), financial innovation and an open and flexible regulatory system can address the challenges of collateral and credit. Finally, although Beck and Cull investigate general trends linked to small and medium enterprises, they argue that policies to support SMEs should not approach them as one block group of firms. In fact, they find that different types of firms have different likelihoods of having access to external finance and might fare better under more targeted policies. For example, female-owned firms in Africa are more likely to have credit (but not in the developing world as a whole) and might be best approached separately from male-firms.